California could be the turning point. Or not… Growing numbers of Americans seek to live a parallel life by limiting their consumption as much as they can to low and no emissions products. But so much more is needed. California has led the nation in some of the steps it has taken against global warming, but giant steps lie ahead. Californians are caught in an exceptionally severe drought. Water tables continue dropping. Its great cities depend on water from declining snowmelt and the oversubscribed Colorado River. At the same time, agriculture uses the vast majority of the state’s water, much in the wasteful manner it always has. The once fertile San Juaquin valley is polluted and under severe strain from over-use by industrial agriculture. If any state epitomizes both the potential and the dangers we all face, it is California. Many trends of industrial consumerism begin and are fully realized in California, perhaps most notably the car culture. Much of the digital revolution, which has led to vast consumption of electricity by Internet “cloud” services, began and continues there. AParallelWorld.com (APW) is a website that brings environmentally conscious consumers together with vendors of minimal carbon-emissions products and services. It has avoided involvement in political conflicts or campaigns. But APW has now endorsed Bernie Sanders, the only candidate who publicly calls for major climate action. APW members are typically “sustainability voters” who want politicians to make urgently needed climate policy. Fear of the consequences of global warming has grown among all voters as climate facts have overcome climate denial propaganda. Despite media denial, the surge of public support for Bernie reflects an even broader public concern about global warming as well as social and economic justice. Bernie’s consistent record on diverse social justice issues has resonated with a growing number of voters. 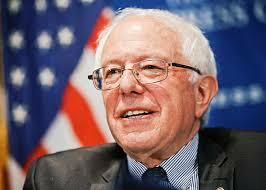 As the only candidate who refuses corporate contributions has become more widely known, so has his popularity. Yet, because of the strange party politics of primaries, especially the DNC “super delegates,” pre-committed to Clinton, the increasingly clear preference of voters may not be realized. That is why the California primary is so important, with the large number of delegates at stake. The “political revolution” Bernie calls for must be achieved to move the nation anywhere near the halt to global temperature rise necessary for climate stabilization. Bernie supports local organic farming, which uses less water and does not use dangerous petroleum-based chemical fertilizers or pesticides. Industrial agriculture has so damaged California’s Central Valley – the bread basket of the nation – that only a revolution in farming practices can save it. Under the extreme growing conditions of severe drought, California agriculture is at great and growing risk; its productivity has already started to fall. Californians have a very big stake in achieving the political revolution that Bernie Sanders calls for. California agriculture uses far more water than the cities or suburbs. Far deeper change than not-watering-your-lawns is needed to avoid the food production failures that agriculture-as-usual will allow to happen. The changes needed to seek a “future we can believe in” where the food chain is sustainable, require a political revolution. The most important prospect right now to stabilize the climate and achieve economic sustainability is to realize Bernie Sanders’ political revolution. That, as Bernie regularly points out, is not just about Bernie becoming president. It is about mobilizing a broad public movement for change. If Bernie does not get the nomination, that will be much more difficult to achieve. That is why the California primary is so important. Getting the nation to “feel the BERN” has been a long up-hill battle. Starting with very low name recognition, Bernie’s straight-forward message has resonated with voters as more people listen. If his views and policies had been as well-known at the beginning, he would probably have enough delegates now to clinch the nomination. Overwhelming victories in the remaining states, especially in California with its large number of delegates, will place Bernie in a very strong position at the convention. Democrats know that in poll after poll, Bernie beats Trump be wide margins. At the same time, Hillary’s marginal lead over Trump has narrowed to a statistical draw. With all her ethical and policy vulnerabilities, Clinton could very possibly lose to Trump. He is vulnerable too. Do we really want a president whose key business strategy is to file bankruptcy to avoid paying investors? With every appearance of being a narcissistic sociopath, the dangers of Trump’s unpredictability surpass even HRC’s risky neo-conservative interventionism and subservience to her Wall Street donors. Neither of them is capable of leading the kind of political revolution that is necessary to mobilize the people to make the fundamental changes required to mitigate climate disruption. As Bernie has often said, this is not about Bernie Sanders; it is about all of us. The fight will go on, yet be so much harder if Bernie is not nominated. But go on it must, and it will not be easy in any case. Much of the work that needs to be done will involve the reestablishment of local and regional sovereignty over all matters of public health and welfare, including fracking, mining, and electricity generation. At some point, early on, national-level policy transformation must be put in place to radically reduce carbon emissions nationally. No president can make Congress move on that, given the influence of corporate lobbyists, without a mobilized public consensus demanding action. The massive climate action that must be launched immediately, will not happen without a prescient president with a mass social movement to back him up. There is just no way around it. The population will have to be mobilized to take the actions necessary to stabilize global temperatures. We must also undo much of the damage already done to the earth’s living systems upon which we all depend. But with Bernie Sanders in the White House, having trounced Trump, the political revolution to achieve national sustainability will be at hand. That is why we must hope that California is BERNing.